It is absolutely imperative that you are prepared for your clients when you are a notary public. Many states allow their notaries to create certified copies of documents. A true copy certification is very different from notarial acts involving a signed document. When certifying a copy, the notary does not and will not issue an oath or take an acknowledgment from anyone. Instead, the notary public will either create or witness the making of a copy of a document. The notary may also be asked to compare a photocopied version of the document against the original document to assure there are no differences in the two before they can certify or affirm that the photocopied version is a true replica of the original. Your state may require you to identify or confirm the photocopying on the document. If a notarial certificate or required text is not provided to the notary, you may have to hand write out all of the information required by the state. That is why we created the Self Inking Notary Certified Copy stamp. You will love just how easy it is to use as well as how convenient it is! Unsure if this stamp is permitted in your state? Contact Us! The Self Inking Notary Certified Copy stamp is a must have for all notaries. It is common practice for many notaries to create or certify a true copy of an original document. 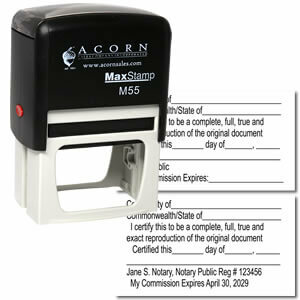 The Self Inking Notary Certified Copy stamp gives you the perfect impression every time it is used. It can last for 5,000+ impressions without needing to be re-inked. When it is time to re-ink, just simply slide the built in ink pad out, squeeze a few drops of rubber stamp ink on to it and you can immediately continue to stamp. Both the durable frame and laser cut rubber die assures a long life for your stamp.